This is my brother-in-law, James Gatewood and his son (my nephew) Christopher. 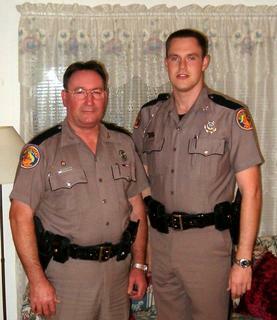 Here is a tip - Don't tell them you know me if they stop you for breaking the law in Florida. James would arrest his own mother if he could catch her. Best I can make out, they really like doing this stuff, but it seems to me it must get old in hurricane seasason. Neither one can do a thing to help their own folks out (or themselves!) when the typhoon season is in full bloom. They get stuck all over creation managing traffic and life-and-death emergencies. Did you ever notice how law-enforecement people have arms that bow out at the waist? They walk like they are packin' even when they are dressed in civies and going to eat catfish at David's Catfish house in Milton. 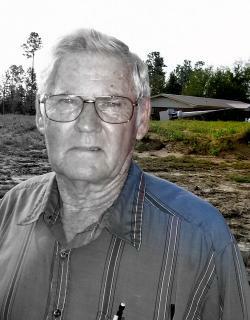 Here is Jack Matchett. Jack is an original. About the only thing that would keep him from a 5AM coffee at the Tom Thumb would be an all-nighter at the casinos in Biloxi. Well that's not a problem for now because Biloxi got blown away (Katrina). The scrabble of trees behind Jack used to be a thick forest (Dennis) and behind me - the photographer- are the remains of Elizabeth Chapel (Ivan). 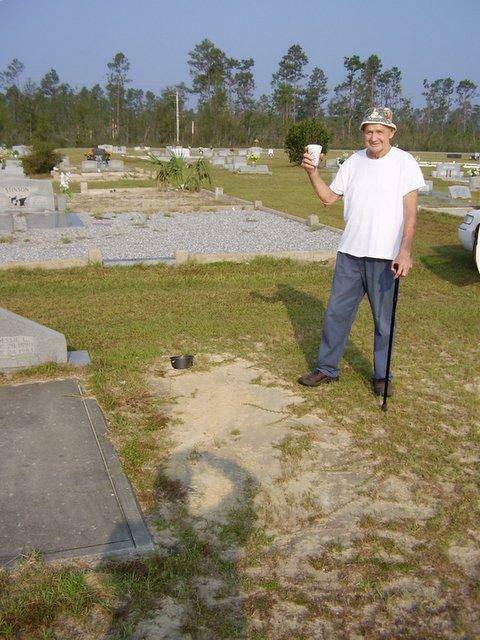 The unmarked grave at Jacks feet is the resting place for my Dad, J.Lee. Dad and Jack once served a tour aboard the USS Shangri-La together in the late 1950's. Well, Jack is now stiff and hobbling around with the effects of chemo therapy and we wanted to make a toast to Dad while I was home. We had some Tom Thumb coffee cups to make it authentic. I know Dad appreciated it. We'll have a nice marker on the grave soon. 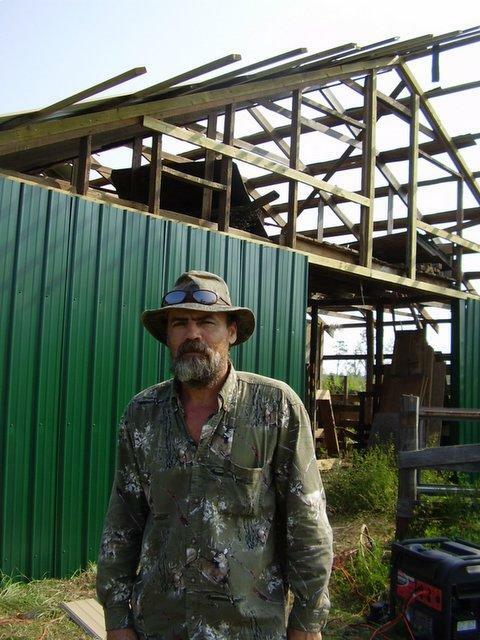 This is Scott Griffin who is quite an individualist and barn builder. He looks pretty mean and he can get suddenly descriptive about things he does not like, like stupid rich people, or stupid poor people or stupid game wardens or stupid photographers --- well about anything stupid -- so the "mean" image tends to stick. But, he's not all that mean. He helped me rebuild the barn - at a reasonable price too. This photo was from early September. Recently he was adding some finishing touches and was called over to my Aunt and Uncles house nearby, to help recover poor old Uncle Lamar. Lamar has alzhiemers and had fallen down outside. My Aunt and cousin could not get him back into his wheelchair and with cuts he needed to be taken to the hospital (which they had just come back from). Good thing Scott was there to help. He is ugly and he is mean (or wants you to think he is), but he has a good heart. Scott told me that my dad, J. Lee, (Dad died about two years ago) used to treat him just like he was a real person. Go figure! 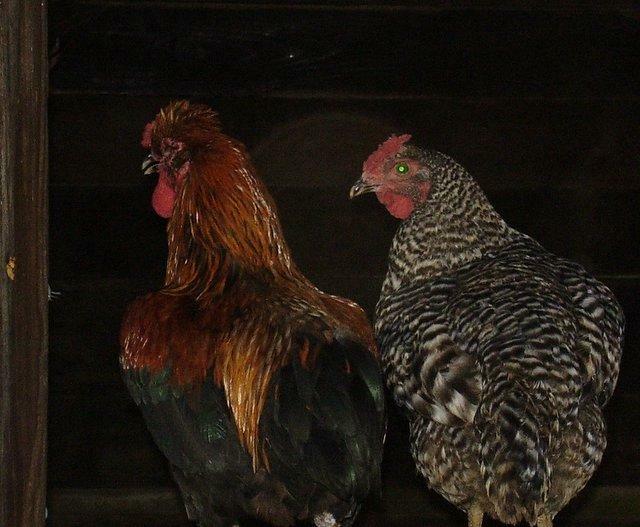 I have a lot of great memories of chickens. I mean the real kind, like the ones that run around your grandma's house. These were at Scott Griffin's house. He keeps a menagerie of domestic animals around. 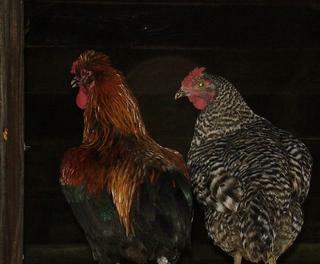 It reminds me that I want to make a video of chickens just clucking and eating bugs and walking around and such. It would make a superb "relaxation" video to go with my other three titles at BuzzCreek: "Snowfall Serenade", "Country Ride" and "Airpanes-Yesss!". 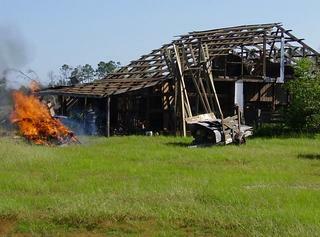 This is the barn at the family farm after Ivan and Dennis wrecked the tin. Here all the damaged tin is removed and I am burning a pile of trash. The thing about hurricanes that gets lost in the shuffle is there are a myriad of reconstruction jobs that never see the newspapers. This is just one small example. If not repaired, what happens to the stuff in the barn? It has to be repaired or lose a $20,000 structure and its utility. So that's what I was doing mainly ... on my last trip home. Barn repair. This was early September and I got me a bunch of boiled peanuts at Lowry's Farm in Brownsdale. I wanted to get some more to bring back to NJ but I missed my chance. This batch was a 'younger' (less mature) harvest and the peanuts at this stage are best for boiling. The ones I got (already boiled) were from an older crop that were processed a few days before. The lady in the green blouse is Mrs.Lowry. 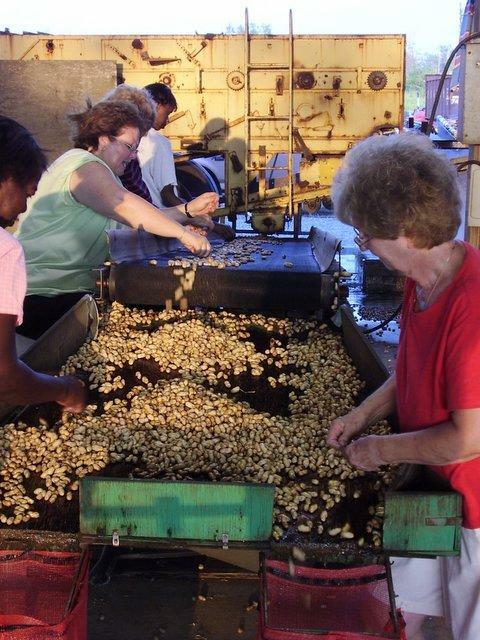 They are culling out the bad peanuts as they come off the washer/ conveyor which is fed from the unloading hopper in the background. I'm a little late placing this note, but I saw Colbert Campbell as I was leaving Florida to return to NJ. It was the day before the ground breaking for the new church. The old steeple from EC is in the background. The old church was destroyed by Hurrican Ivan. Colbert manages the church cemetary and has a very good set of records on who is in there. Earlier on this blog you can see a picture of the church after it was wrecked by Ivan.